The most outstanding feature of this crab apple tree is the large fruits it gives you. Not only do they last much longer into the season (December) but make excellent crab apple Jelly too. For the romantics amongst us, the fruits could be described as a heart warming, early sunset tones of delight, joy and ever lasting hopefulness. For people without excessive levels of oestrogen that means orange/pink apples. The over whelming new life Arctic canvas (strong white flowers) hug the tree canopy is an unconditional and loving manner (cover the tree). Malus Jelly King is a powerful and determined leader of the garden with aspirations of greatness that are cruelly cut short by genetics (vigorous but yet compact). A small tree growing to around 4 metres tall and slightly less wide at the 10 year point. It could go on to grow more or stay where it is, local conditions and genetics dictate what happens next. Manual pruning obviously keeps it as low as you like although pruning back to dandelion level could lead to disappointment. 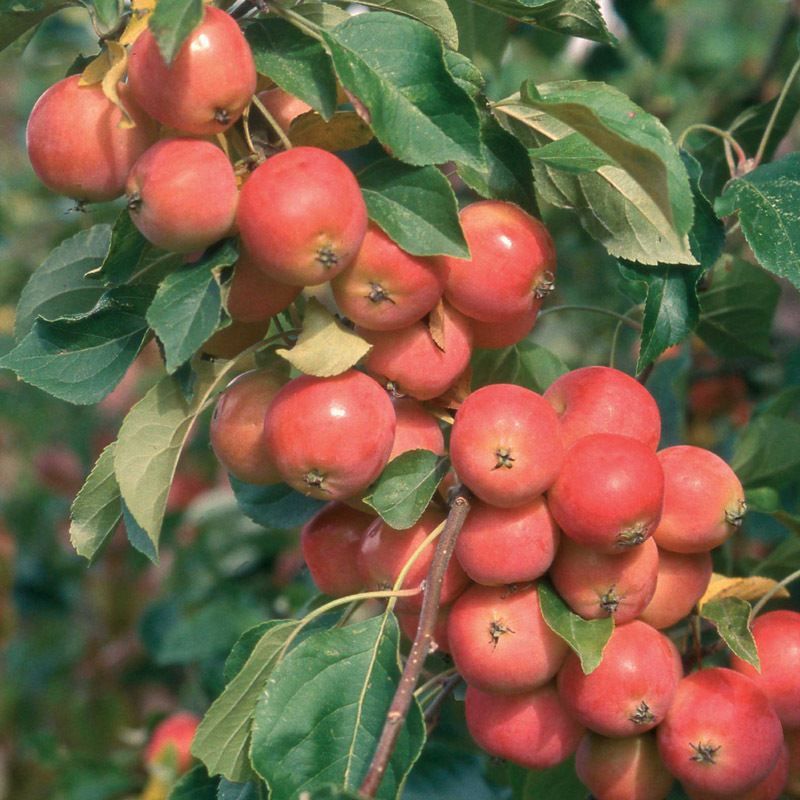 Malus Jelly King is in pollination group 4 which means you will need another apple tree in groups 3,4 or 5 for it to produce fruit. Most housing estates will have plenty of pollination partners around however best results will be had from having one as close as possible. Some light pruning will encourage new growth. This usually means taking around a third off each of this seasons growth to ensure you do not get "leggy" branches that will struggle to carry a heavy apple crop and deal with strong winds and heavy snow. Late winter is the best time to do this. Plant in fertile well draining soil. Considered to be clay tolerant which doesn't mean you will see it reenact the scene from the film Ghost but that if you have heavy soil it will be ok. You have nothing to loose by mixing the excavated soil with 50% well rotted manure or compost. Hardy down to minus 15 degrees Centigrade so if you are buying this as a gift and the recipient comes home early, you can hide it in the chest freezer, November to March only. All other times you would have to disguise it as a hat rack or try to distract them with a bigger issue e.g. pretend to be Jesus. Most smaller trees are suitable for growing in a pot and this one "should" be ok. The larger the pot, the better it will be. A 12 litre pot will dry out in a day of full summer sun whereas a 150 litre pot takes about 5 days. Make sure you feed every year if you are going to pot plant. We are chasing after them at this very moment, we hope to wear one down asap to write something nice.